Just 17 days left until Santa is coming. Hi, my friend! How are you doing so far? Are you totally in Christmas mood? Did you already decorate the whole house singing and dancing? Today we head into recipe No.6 of our 2017s Christmas baking journey. How many recipes did you already make? Is your house smelling like cinnamon, sugar, chocolate, rum, eggnog, gingerbread? If not then make sure that you are well prepared and armed with the best of the best Christmas recipes for your holidays asap. Click here to see my favorite Christmas baking recipes. All recipes are easy to make, and a must-have for Christmas. Ok, let’s dive into the today’s recipe. Eggnog Truffles. The best Eggnog Truffles to be exactly. 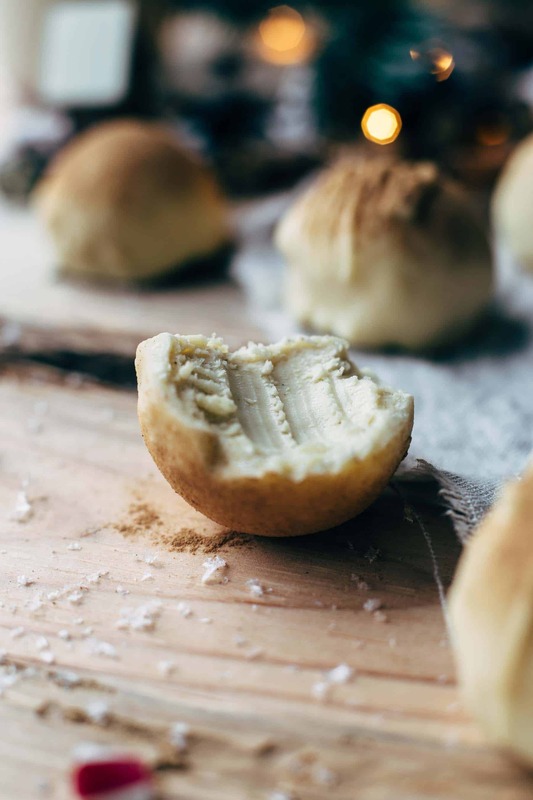 Imagine creamy and spiked Eggnog Truffles made with real eggnog. ¾ cup of eggnog and 3 tbsp of rum. And 2 vanilla beans. Oh. My. We get a load of eggnog flavor today. 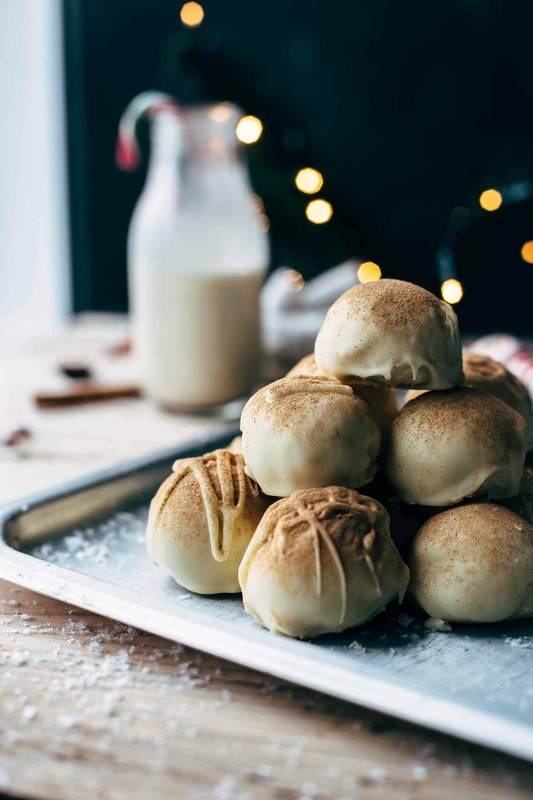 When I browse through Eggnog Truffles recipes and see that they contain no eggnog, I always think that these are technically seen no Eggnog Truffles. You know what I’m sayin’? The white chocolate and the butter give them a nice texture. The white chocolate is not dominating the taste. I froze mine for about 15 minutes and scooped them with an ice cream scoop. I leveled the back of the scoops by pushing in the back of the truffles after scooping. Then place them on parchment paper and freeze them for 1 hour until really firm. To make sure that your eggnog truffles don’t melt away why dipping in chocolate, melt chocolate at the time when you put the truffles in the freezer and let it cool to almost room temperature. 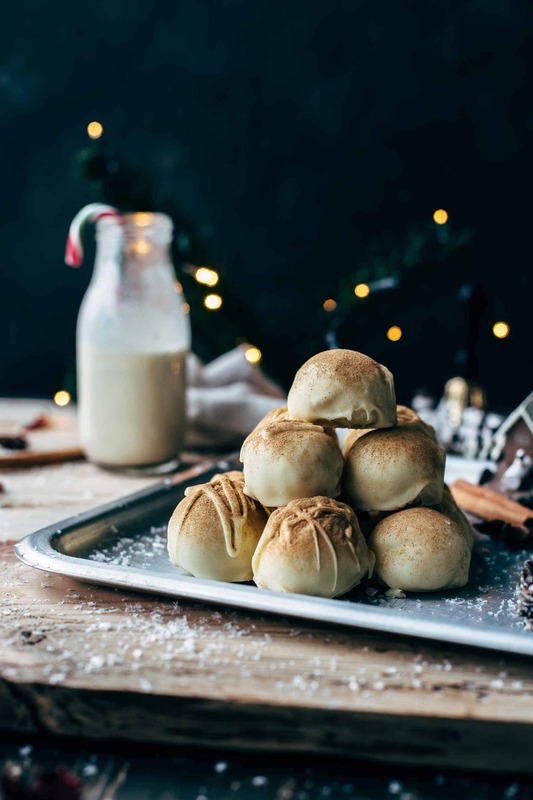 If you make this super creamy Eggnog Truffles recipe which comes with lots of eggnog, leave a comment, rate it and tag a photo #alsothecrumbsplease on Instagram! Would love to see your snap! This ultra creamy Eggnog Truffles recipe is made with lots of eggnog and requires just 5 ingredients and 15 minutes prep time. It is like you bite into ball-shaped eggnog. 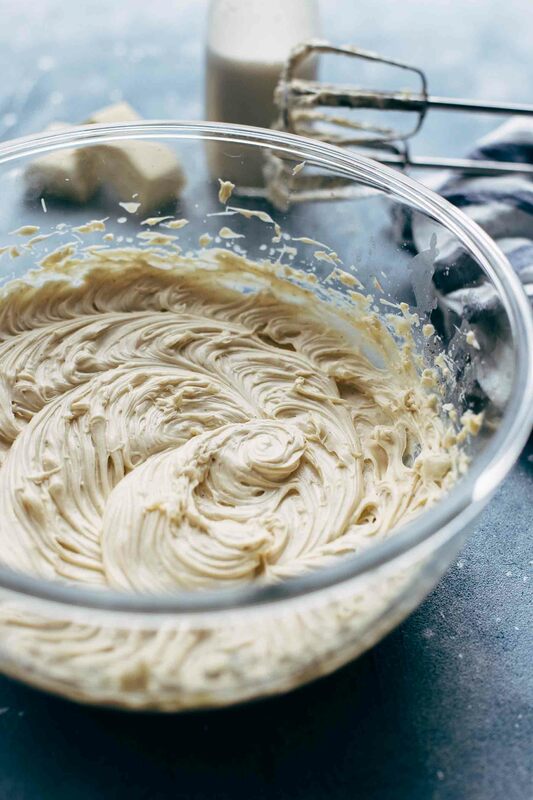 With a handheld or stand mixer fitted with a whisk attachment beat butter on medium speed until soft for about 1-2 minutes. Add melted chocolate and mix until creamy for about 1 minute. Add eggnog and mix on low speed just until combined. Add rum and vanilla* and mix until well combined and smooth. Chill for about 15 minutes in the freezer until firm enough to scoop with an ice cream scoop. Level the back of the scoops with your hand by pushing slightly against it (watch also video above). Place scoops on a parchment paper layered sheet. Freeze for about 1 hour. Dip truffles in melted chocolate and let dry in the fridge for about 10-15 minutes. Sprinkle with nutmeg or cinnamon before serving if desired. Store leftovers in the refrigerator up to 2 weeks. Oh, oh DARLING. These look perfect. Decadent little truffles like this are one of my favorite mid afternoon snacks. I know exactly what you are talking about. Thank you so much. Enjoy them! Drooling already. 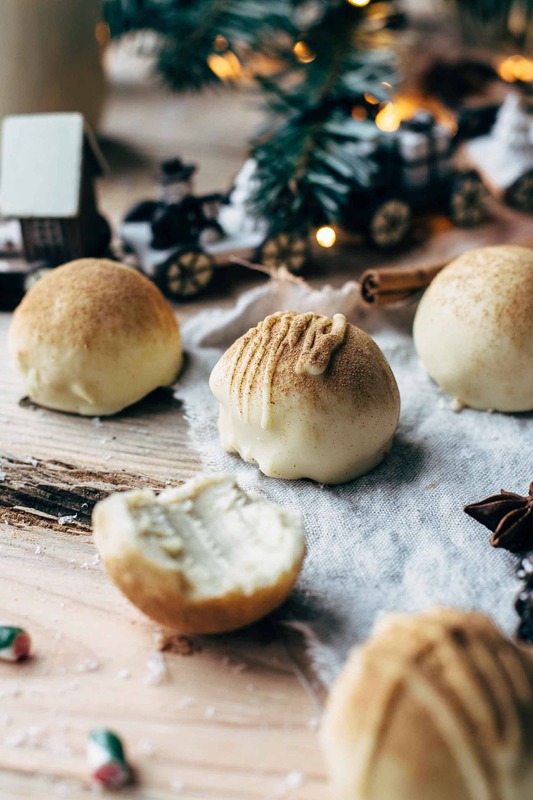 These look SO good- how have I never thought to try an eggnog truffle before? Swoon. I know, Karly. Once you tried them you won’t miss them anymore. Thank you! Could you use candiquik or do you need to use real white chocolate? You could use candiquik for the coating. For the filling, I recommend using real white chocolate because of the consistency. Can rum extract replace the rum? I know you coated the top with some ground nutmeg, but have you tried to add additional nutmeg inside? These sound super vanilla flavored, so I was just curious since I LOVE nutmeg! Yes, I love the taste of super vanilla flavored eggnog. But you could add just 1 vanilla bean (or skip it completely) and add 1/4 tsp nutmeg to the truffles. Then the nutmeg taste is more present. Happy holidays!